The Sunflower Sweetness™ Bouquet brings light and beauty to your special recipient's everyday, making this spring season one to remember! 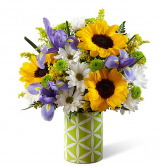 Gorgeous and bold sunflowers, blue iris, and white daisies are brought together with yellow solidago, green button poms, and lush greens to create a sunlit fresh flower arrangement they will love. 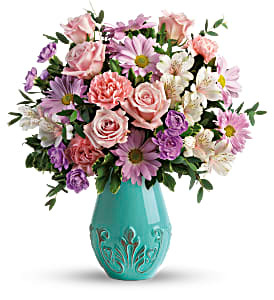 Presented in a stylish teal ceramic vase with a Moroccan tile pattern in white throughout to give it a carefree and modern look, this spring flower bouquet is ready to create that perfect thank you, thinking of you, or congratulations gift. 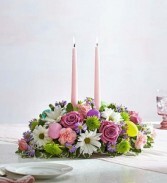 Easter Centerpiece Product Code: 105663 Easter Centerpiece Get the party “hopping”! We’ve designed a fun and playful version of our favorite traditional centerpiece to celebrate Easter! 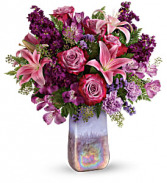 A mix of soft pastel blooms is accented with colorful Easter eggs for a charming touch. Topped off with taper candles to cast a warm, cozy glow, it's a truly original way to share holiday smiles with family and friends.